Yesterday I finished reading one of the most remarkable books that I have read for a long time. Longlisted for the Man Booker Prize, shortlisted for the Desmond Elliott Prize and given rave reviews in pretty much every broadsheet newspaper going, The Unlikely Pilgrimage of Harold Fry is a growing word-of-mouth book phenomenon that seems to be popping up everywhere I go, rather like David Nicholls’ One Day did a couple of years ago. Personally I felt that One Day was over-rated, which is perhaps why my vague association between it and Rachel Joyce’s debut novel meant it has taken me so long to finally read the latter. But I have done, and I’m so glad I did. This was a book that truly reminded me just why it can be so very rewarding investing your time in a novel. Harold Fry is an unremarkable man. Recently retired from the local brewery, he lives a comfortable but empty existence in the suburbs of a small South Devon town with his wife Maureen. One April morning, as he reads the post over breakfast (apparently they still have early morning deliveries in South Devon), he comes across a pink envelope containing an unexpected letter. The letter is from a woman he hasn’t seen in twenty years called Queenie Hennessey, who once worked at the brewery with Harold; she tells him that she has cancer, and that there is nothing more that the doctors can do. We are told that she once did something kind for Harold, but then left the brewery suddenly without saying goodbye to him. A vague sense of guilt at not thanking her has stayed with him ever since, and it takes the pink letter with its stark message of goodbye to spur him out of his chair to do something about it. He tries all morning to write a suitable reply to this unexpectedly devastating message, eventually producing a brief note that he feels he should send right away. Taking little more than his jacket and wallet, Harold trots down the road to the post box – but upon reaching it, keenly feels the inadequacy of his note. He decides to walk on to the next post box instead, but feels the same thing there. After rejecting a dozen opportunities to post his letter, he instead stops to phone the hospice in Berwick-upon Tweed where Queenie lies dying, and finds himself promising a strange thing to the nurse who answers the phone. He will walk to see Queenie; as long as he keeps walking, she must keep living. The walk is for Harold a way to atone for the mistakes of his past and in some way a chance to save one of the few people that he realises he can still call a friend. Knowing that if he turns back for home he will never set out again, he leaves then and there: no proper shoes, no change of clothes, no map or mobile phone. Just the knowledge that he must keep walking to Queenie. This is an odd decision indeed, as Harold is not a walker. As his wife tartly notes, the furthest he has ever previously walked is to the car. Ill equipped for a six hundred mile, three month expedition, he none the less perseveres, letting the rhythm of putting one (sore, blistered) foot in front of the other free his mind to wander through his memories. He thinks of Queenie and their time working together. He thinks of Maureen, who has moved into the spare bedroom and only seems to speak with him when she has something to criticise him for. He thinks of their son David, who he hasn’t spoken to for years. He thinks of his mother, who walked out on him shortly before his thirteenth birthday. Back in Devon, Maureen thinks of Harold; first crossly, but then with real regret at his sudden departure. 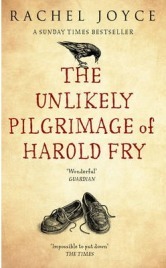 Harold’s pilgrimage seems to inspire a lot of thinking and feeling and changing of minds amongst those he encounters. This is a beautifully written novel. The language is simple but used almost poetically, and I found it very moving in a way that I don’t often experience with books. That said, it never becomes cloying or overly sentimental. Joyce has created real characters in Harold Fry that you can’t help but feel something for. However, while Harold and Maureen are at the core of this book, I couldn’t help but feel most of my sympathy for Queenie. No one in this novel seems to have an easy life, but poor Queenie ends up so alone that, faced with her death, the only person she has left to write to from her hospice is someone she worked with over twenty years previously; the sort of isolation she must have experienced in her later life to create that situation is quite breath-taking. This feeling also made me a little cross with Harold. As important as his walk is to him, by doing it rather than getting on the next train north he is also condemning a lonely old woman to remain lonely for yet more weeks when she has such little time left. As a reader I did feel that whatever the benefits of Harold’s pilgrimage, perhaps he could have comforted his friend a little longer and made amends a little later. Harold is basically a good man, but I could I could see why Maureen often got frustrated by him! The Unlikely Pilgrimage of Harold Fry is a book that will stay with me a long time, and having finished reading it I am quietly mourning the loss of its companionship. Despite some of Harold’s encounters along his journey feeling slightly superfluous and his outlook on life occasionally tipping over into the pious, I ended up really enjoying it. It was hard to believe that this is Joyce’s debut novel and I look forward to reading more by her in the future. I therefore commit myself to becoming part of the word-of-mouth phenomenon and urge anyone reading this to try Harold Fry for yourself. I’m sure most readers will not regret doing so. One Comment on "The Unlikely Pilgrimage of Harold Fry"
I just finished reading this myself. I avoided reading it because I was worried that it might be not as good as the hype. I found that was unreasonable. It is a truly lovely novel, despite the slightly Christian undertones she throws in along the way.